Hearst revenue grew 4% to $11.4 billion in 2018, led by investments in financial data company Fitch Group, according to CEO Steve Swartz’s annual letter on the company’s performance to employees. Revenue growth was also attributed to gains in the medical information and software companies that make up Hearst Health, aviation-safety data company CAMP and Hearst Television, which operates 33 stations in the U.S. One-third of Hearst’s profits came from its business and medical data and software operations, “what we call Business Media,” Swartz wrote, up from 14% five years ago, and led by Fitch Group. Swartz expects that number to grow to approximately 40% of total profits in 2019. In 2018, Hearst acquired an additional 20% of Fitch, making it Hearst’s largest wholly owned company. 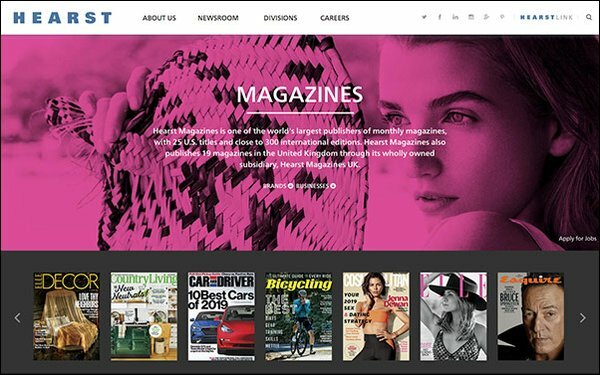 “These Business Media assets, which spring from our legacy of publishing trade magazines, have strong and stable management teams, are 100% digital in their delivery and are subscription-based,” Swartz wrote. The CEO did not mention any specific gains or notable record growth in Hearst’s print or digital publishing businesses in the letter. “Hearst still gets the majority of its profits from the consumer media space, with the vast majority of those profits coming from the television business, both cable and broadcast,” Swartz wrote. “Our newspaper and magazine companies continue to be solidly profitable,” he added. Despite soaring cross-platform traffic and video audience growth year-over-year, these numbers have not translated into significant revenue gains for Hearst’s print and digital publishing. “We expect both Magazines and Newspapers to return to profit growth in 2019,” Swartz wrote, referring to the divisions at Hearst. The publisher made more than $3 billion in acquisitions and investments last year, and grew its workforce by 3%. (Tthat's more than 600 new employees, bringing its total of full-time workers to more than 20,000 worldwide. Over the past six years, Hearst has made more than $11 billion of acquisitions.